The 20V Switchdriver cordless drill/driver holds multiple bit pairings so you get your work done twice as fast, with half the hassle. No more fumbling around for loose bits. Give the head of the power drill a quick twist and switch from drilling to driving in an instant. And since the Switchdriver drill is part of the 20V Power Share platform, you can share batteries with other 20V WORX tools you already own, saving time and money. Drill like a pro thanks to the 2-speed gearing on the wireless drill that delivers the speed and power you need to tackle any project with ease. The two 1/4" chucks on the Switchdriver cordless drill/driver rotate 180° clockwise or counterclockwise with a push of a button, so you can switch from drilling to driving in an instant. The compact and lightweight Switchdriver power drill set is equipped with electronic torque control which prevents your screws from stripping and eliminates any potential damage to your work surface or materials. 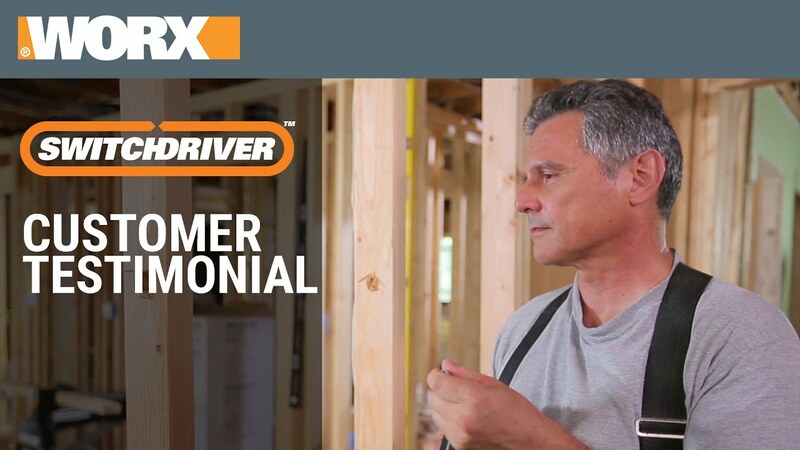 WHY CHOOSE THE SWITCHDRIVER CORDLESS DRILL SET? The two ¼" chucks on the Switchdriver cordless drill/driver rotate clockwise and counterclockwise 180° with the push of a button so you can move through projects quickly — no need to swap out tools mid-job. Select the drill and driver bits you need from the drilling tool kit for your specific task and have them loaded and ready to go — no fumbling around for loose bits. The handheld power drill’s electronic torque control helps you manage force to eliminate stripped screws and limit potential damage to your work surface and materials. Illuminate your work area with the trigger-activated LED light on the wireless drill so you have ideal visibility under any working conditions. The 20V Switchdriver handheld power drill/driver lets you power through projects without stopping to grab another tool or even fumbling with loose bits. Just drill your hole, switch chucks with the push of a button, and drive your screw. Keep it moving! At just over 3 lbs., the 20V Switchdriver wireless drill is compact and lightweight for better control and less fatigue while working. The rotating dual chucks make switching between bits faster and smoother than ever. The electronic torque control of the Switchdriver screwdriver drill helps eliminate stripped screws and limits potential damage to your work surface and materials. Deliver clean holes and ample driving power every time with this cordless drill set. The Switchdriver power drill set is powered by a 20V MaxLithium battery and features variable 2-speed gearing to tackle all common drilling and driving applications. Dial up the power you need on the cordless drill/driver for the task at hand. The Switchdriver driver tool kit includes a lightweight and efficient 20V MAX Lithium battery, shareable among our entire line of 20V DIY yard and power tools, saving you time and money. 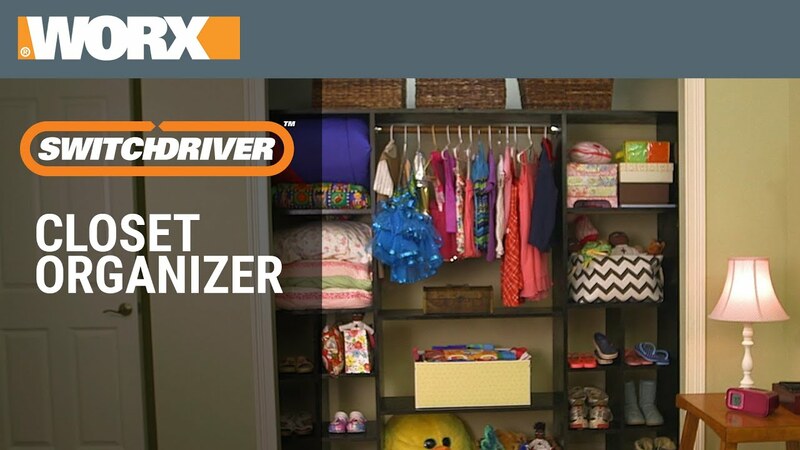 That’s Power Share™, only from WORX. This model (WX176L.1) includes a 67 piece project kit of bits to help you tackle any project you've been putting off. 20V Switchdriver Cordless Drill & Driver w/ 67 pc. Kit is rated 4.8 out of 5 by 734. Rated 5 out of 5 by Thai Nguyen from Pefect for my job Just got it yesterday. I am so happy with it. Rated 5 out of 5 by bobbyfrazier19 from The Drill & Driver & 67pc. kit is great... I'm so glad I didn't wait no longer to purchase. Rated 5 out of 5 by BoboMelon from The best drill I have ever owned The best drill I have ever owned. It is so convenient that you could just switch from one bed to the next by just rotating the head. And I love how easy it is to change out bits. If you don’t have one you need one. Rated 5 out of 5 by 70ss396 from Very Nice This tool is a real time saver. No more constantly changing bits. Seems to be very well built and the bonus of the bit kit was perfect for my needs. Rated 5 out of 5 by xtremeplayer69 from Powerful and long lasting battery Fantastic design and powerful. I used this recently to drill through my frame rails without issue. The switch driver part is nice I could load the pilot bit and keep.the large bit on the ready. Rated 5 out of 5 by Jbfalcon from Excellent choice! I have had it for a while and can’t live without it! Rated 5 out of 5 by Raydor3 from Solid tool I have used this tool to put up new blinds and it was a real time saver. The switch is easy to use. Rated 5 out of 5 by Smokie57 from The best ideal ever This is so convenient. I don't have to switch from a drill to a screwdriver, its the best invention ever. No way you'll keep these in stock. Glad I got mine now.. Rated 5 out of 5 by Mister Checkers Magician from The Perfect case for the Perfect Tool! As if the 20V Switchdriver itself wasn't fantastic enough, now WORX, (The DIY guy's best friend) offers a package that has this perfect tool and the perfect case and perfect set of 67 bits to boot so that you can perform some perfect "Do It Yourself Magic!" Hooray for WORX for putting this package together. I had the basic Switchdriver, but I bought another with the case and 67 piece set of bits! Amazing! I save so much time with this very efficient tool that I just go from project to project, getting better all the time. I wholeheartedly recommend this complete Switchdriver package! It's perfect! If anything, I would like to see the case with bits sold separately for those of us who already had a swirtchdriver, but I use this so much, it's great to have one for home and work! God bless the WORX company! Rated 5 out of 5 by mshopteacher from Another great peace of equipment from Worx to add. I just bought this power tool. I installed a new wooden fence around my house this past Fall. It would have made my job a lot easier. Not having to be changing from drill to screwdriver tip would have been great. I could have just flipped the chuck tip. I recently changed a few planks on the fence and did it in half the time. I look forward to making good use of this power tool. Rated 5 out of 5 by Papa Scotty from Great tool that is easy to use I have had this tool for a couple of years. My only disappointment was when I ordered the drill bit kit, that they came with standard shanks. They would not fit in this drlll. I just ordered this one as a gift. I hope that the drill bits will now fit in the drill. I will find out in a month or so, when I visit my sister. Rated 5 out of 5 by Colorado Gramma from Easy to use This is the second switch driver I have purchased. My soon to be 19 grandson was helping me with a small project and he liked mine so much I ordered one for him for his birthday. He loves it as much as I do. Rated 5 out of 5 by Ttopvette from Fantastic drill I bought this about three weeks ago and loved it. I took it to work and used it for three days, without having to charge the battery, and felt like I could not do without it. However, someone at work decided they needed it more than I did and during lunch on the third day it disappeared. Now I have the charger, one battery and all the attachments,but no drill/driver. I would like to purchase another one with only one battery, but don't seem to be able to get that combination. Any help would be appreciated, because I want to replace my stolen one as quickly as possible.. Rated 5 out of 5 by jjkat7 from Speed and Versatility make for a Great Tool. I received this for a gift and looked at some videos of how it works. I used it for the first time building a set for my daughter’s school play. WOW is the best way to describe how great this drill works. I saved so much time not having to un-chuck and re-chuck from drill to Phillips while drilling pilot holes. The carrying case with all the different drill bits came in handy as well. I highly recommend this drill from the pro to the average home repair person. Rated 5 out of 5 by WoodWORXman from Awesome Switchdriver This is my second switchdriver. The case and drill bit set makes it incredibly convenient to do numerous projects on the go. I will be dedicating this one to my workshop but upcoming projects like deck building will be made easier by putting both into action. The tool is comfortable, light weight and offers good power and long battery life. Totally awesome! Rated 5 out of 5 by Mat04 from AWESOME TOOL This switchdriver drill has made jobs much easier and faster. now I don't have to worry about changing bits every time. I have more time to do projects at home. the drill is to use that even my wife loves it. Rated 5 out of 5 by Tommy Z from Another GREAT tool!! 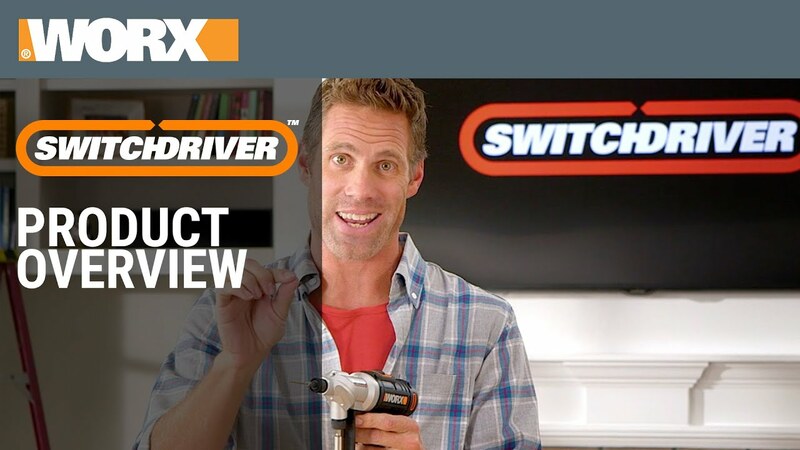 I just got in my latest Worx tool...the switchdriver, and I am totally satisfied. I always have to predrill and use screws in my 90 year old home because of the dry, hard wood, and this tool does the job perfectly!! Best of all, it cuts ladder-time by at least 1/2. Rated 5 out of 5 by Tracie55 from Best tool ever!! We just bought this particular set but had bought the smaller set about a year ago. There is no better tool out there; so light weight and easy to use! Rated 5 out of 5 by RonShane from Great tool & kit I had previously owned just the switch driver, but with 67 piece kit and the case included, I just couldn’t resist getting another. I even ordered another one for my son as a Christmas gift. A very nice tool!! Rated 5 out of 5 by seanpaulwomack from Great Value! The 20V system is awesome because all the tools share the same battery! The switchdriver is so useful, I have purchased two, one for me and one for my dad! Being able to keep a drill bit in one side and a driver in the other saves so much time! Rated 5 out of 5 by New Englander from Awesome Really solid. The case is sturdy and well-made, the attachments are everything you might need, and the tool itself is basically a work of genius. Compact, well-balanced, easy to use but powerful... and fun! Bought this as a gift for someone, now I want my own! Rated 5 out of 5 by CAROLYN Coleman from Greatest tool yet I bought this almost a month ago . Started using it right away . I love the features , because it saves you so much time when working . Rated 5 out of 5 by Newyorkjoe from Don't leave home without it Out of all of my collection of worx tools I value this one most of all. The versatility of going from screwdriver to drill with a switch of a button is exhilarating. I've had contractors come to my house to do work and I've offered my switch driver to them. They was taken at the ability of this tool to simply press a button and switch from screwing to drilling without losing a beat. I utilize this to on a weekly basis to do project some small things to big things. This is my most valued tool of all the tools I possess. If you're going to do any type of carpentry work or anything of a sort, please don't leave home without this tool. Rated 5 out of 5 by Arjun from WORX always WORKS GREAT, amazing products Undoubtedly WORX products are great, awesome performance, so easy to use. I have been using WORX products for about 6 years, there were no single issue or complaint so far. Recently, I just bought 20V Switchdriver Cordless Drill & Driver. I also recommended my friends to buy Lawn Mower, glad they loved it.